In today's post I introduce to you a beautiful collaboration of two quintessentially British brands with a seventies influence; Ravel and The Victoria and Albert Museum. Perhaps a somewhat unlikely collaboration but one that just works. Created especially for SS17, the four piece capsule collection includes a heeled court, a block heeled sandal, a summer wedge and a structured flat. Something for everyone it would seem. You can see the full collection, in all its floral glory here. I instantly fell in love with this beautiful pair of floral heeled courts and the moment I laid eyes on them I knew exactly how I wanted to style them. With a shoe so beautiful, I kept my outfit to a minimum as to let the heels really do the talking. With florals set to be a huge trend for spring/summer, a shoe is the perfect way to incorporate the print quite easily into your everyday outfit. Better still, they'll also transition nicely into autumn. Just switch your light wash denim for a black skinny jean and you're set to go for another season. What's not to love?! In today's post, I wanted to add a modern spin on a classic court style heel. A heeled court is something that hopefully most women possess and more often than not is something you'll reach for with fairly little thought. With raw hems being a prevalent trend in the denim department for the last few seasons, I couldn't help but pair these courts with my favourite denim style right now. 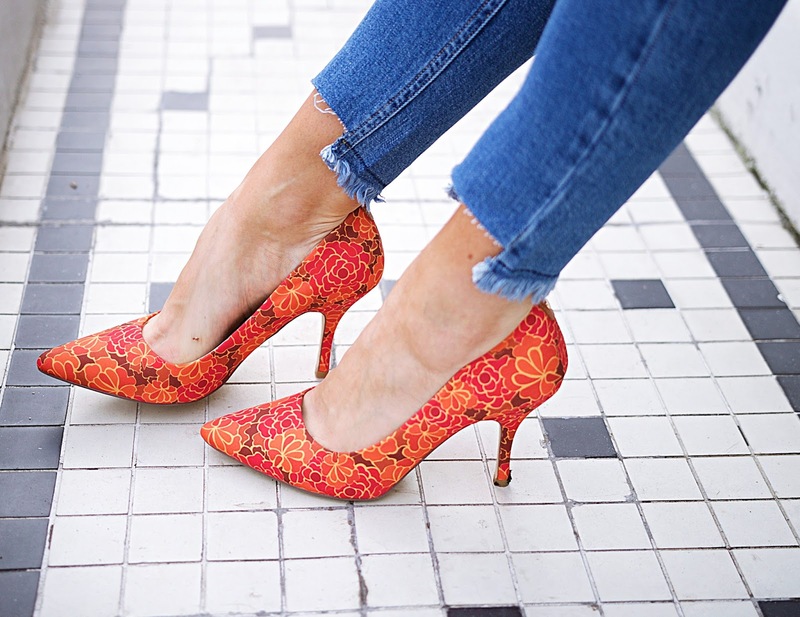 I'm particularly loving the contrast of my light denim jeans against the orange floral print of these amazing court shoes. 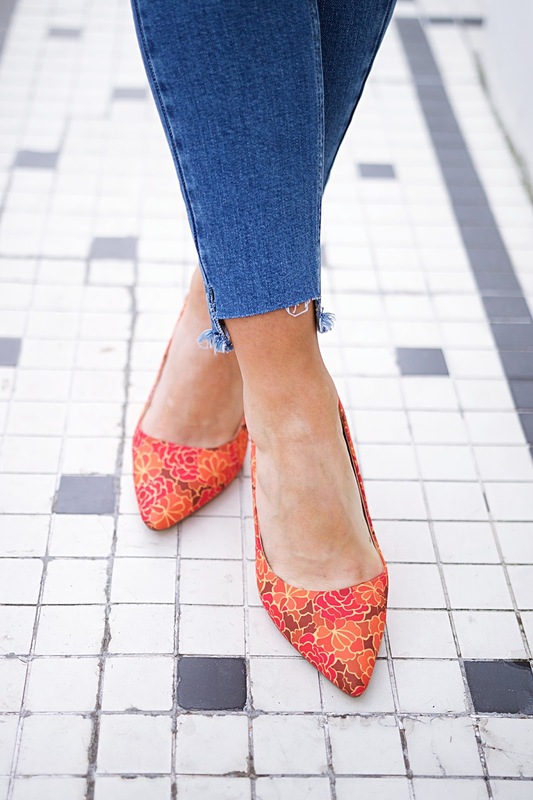 The jeans really do the job of making these heels pop and if you're going to wear a statement shoe, you've got to do it right. Don't you think? This post was sponsored by Ravel. All words, styling and photography are my own. Love the touch of the shoes, great one girl! I want this entire outfit. Love the layered look too!